National Ballet of Canada principal Svetlana Lunkina shares the choreographer who pushed her to the next level and secrets of her conditioning regimen. Wayne's world: Despite being naturally limber, when Svetlana Lunkina worked with Wayne McGregor on his incredibly elastic Chroma, the rehearsal process pushed her boundaries. "Wayne told me, 'You are so flexible, but I think you can do more,'" she says. "It was amazing to see how sometimes we think we're at our limit, but we actually could go farther." Since then, she's actively been working on her flexibility. Costume sketches for Alexei Ratmansky's new "Harlquinade" for ABT. Courtesy ABT. The long wait for Alexei Ratmansky's Harlequinade for American Ballet Theatre is finally over. June 4-9, catch ABT at the Metropolitan Opera House in this bold and colorful tribute to the Italian commedia dell'arte traditions, based on the archival notes of Marius Petipa. If this trailer by Ezra Hurwitz is any indication, this new story ballet is sure to delight (fingers crossed that those dogs make their way to the stage). Onstage This Week: Wayne McGregor's New "Rite of Spring" for ABT, Miami City Ballet Opens the Spoleto Festival, and More! Boston Ballet in Bournonville's "La Sylphide." Photo by Angela Sterling, Courtesy Boston Ballet. Ever since Vaslav Nijinsky shocked Paris audiences in 1913 with his Rite of Spring for the Ballets Russes, dancemakers from Sir Kenneth MacMillan to Pina Bausch have tried their hands at choreographing to Igor Stravinsky's infamous score. This spring, Wayne McGregor will be added to that list. The Royal Ballet resident choreographer's first work for American Ballet Theatre, titled AFTERITE, will premiere at the Metropolitan Opera House in New York City on May 21. Known for his grounded and experimental movement style, McGregor's work will feature video designs by innovative filmmaker Ravi Deepres and sets and costumes by designer Vicki Mortimer, both longtime collaborators. Alessandra Ferri, who has collaborated with McGregor in the past, will join ABT as a guest artist. Derek Dunn in William Forsythe's "In the middle, somewhat elevated" at Houston Ballet. Photo by Amitava Sarkar, Courtesy HB. 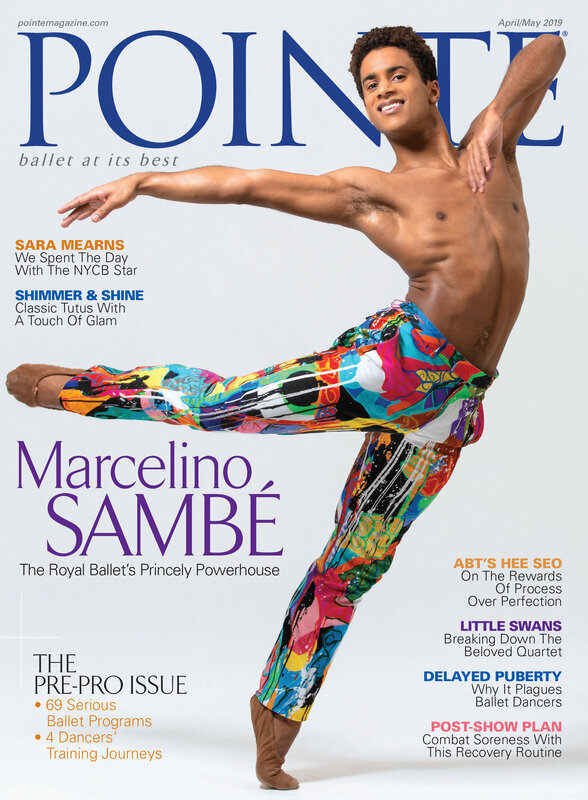 A year ago, Derek Dunn was one of Houston Ballet's brightest young talents (oh, and he was also gracing Pointe's cover). So some were surprised when he announced that he'd be joining Boston Ballet as a soloist this season. We caught up with Dunn as he prepares for two season-opening premieres November 3–12, to see how he's settling in. You danced with Houston Ballet for five years. Why did you leave? It wasn't really about me leaving Houston—it was more me being curious about what else was out there. I got really lucky when I landed that job. I did a competition and afterwards Stanton [Welch, HB's artistic director] asked me to audition for an apprenticeship. I wasn't even necessarily looking for a job at the time; I was only a junior in high school, and I wasn't really sure if I was going to continue training for another year. So Houston Ballet was the only place that I even auditioned for, and really all I knew. After five years, I think it's only natural to be curious about how other places work and what their environments might be like. When I came to Boston to take class last year, I felt an immediate positive energy from everyone. On top of everything else the company has to offer—the rep, the talented dancers, the city—it was hard to pass it up. What's it like being the new guy at Boston Ballet? I've been really happy with my decision so far. Of course, joining a new company, you're not really sure what you're going to be thrown into. You have to prove yourself right away. But the amount of opportunities I've gotten already has been incredible and I'm really excited to do everything this season. It's been a really good start so far—very busy, but good. Photo by Andrej Uspenski, Courtesy ROH. Wearing leggings and a puffy vest as she works in one of The Royal Ballet's light-filled studios, Charlotte Edmonds could pass for a corps de ballet member. Instead, she is choreographing on them, creating dynamic, ballet-based contemporary dance in her role as the company's first-ever Young Choreographer. "At the Opera House you have dancers who have 20 years more experience," she says. "I bow to their experience, but I also try to hold the room. It is sometimes quite nerve-racking! But it is always exciting." to dancers and the mentorship of renowned choreographer Wayne McGregor. Shades of Intensity: The Royal Ballet's Sarah Lamb on Wayne McGregor's "Chroma"
Lamb with Federico Bonelli in Chroma. Photo by Bill Cooper, courtesy ROH. In Wayne McGregor's high-octane Chroma, The Royal Ballet's Sarah Lamb finds meditative stillness. Chroma was the first ballet I worked on with Wayne McGregor, and it was like embarking on a relationship for the first time. There's a heightened energy, an expectation and also the desire to be a vehicle for the choreographer's ideas. The creation process was very easy. Wayne didn't give me any information about my role before we started—he doesn't try to analyze anything before it happens. The whole piece is a painting with people: We're in a monochrome environment, wearing light colors, in a white spot. The first time I appear onstage is for my pas de deux. It often stands out because it comes after a period of loud, staccato, energetic music, and then there is this calm. It's quiet piano music, very meditative—the composer Joby Talbot's title for this section is “…a yellow disc rising from the sea…" One image that I have in my head is of a pebble being dropped into water, and the circles emanating out from it. There's a stillness, but there is also a continuity of movement, an echo and a reverberation. Story Ballets for the 21st Century: What Are the Secret Ingredients of Today's Successful Narrative Works? Jillian Vanstone and Dylan Tedaldi in Alice's Adventures in Wonderland. Photo by Bruce Zinger, Courtesy National Ballet of Canada. In the Prologue to Christopher Wheeldon's recent ballet The Winter's Tale, two boys, princely playmates who one day will become kings, are joined onstage by two women veiled in black. They stand, one beside each child, mysterious, disquieting. They hint at the power that women in the ballet will have over men's imaginations as objects of fierce passions or idealized love. In a brief, evocative tableau, the choreographer foreshadows the darker themes of Shakespeare's play, the ballet's source, and their joyful resolution, distilling in a brief passage the story's emotional arc. Choreographing story ballets that will appeal to contemporary audiences presents unique challenges even for experienced dancemakers. A too-literal approach or too-traditional staging can seem quaint or flat. And what makes a suitable narrative for those coming of age in a digital era, where there are no strictures on what can be searched, seen and shared? How can a story ballet hold audiences' attention? If mere distraction becomes the goal, how can a ballet achieve the resonance that will give it continued life? The May, 2015 premiere of Wayne McGregor's Woolf Works was part of a recent resurgence in narrative and semi-narrative ballets deriving inspiration from works of literature. In this video by Malcolm Venville for Nowness' Portrait of a Dancer series, we see Royal Ballet principal Sarah Lamb performing McGregor's choreography from Woolf Works, overlaid with the only remaining recording of Virgina Woolf's voice. In her aristocratic accent, Woolf asks "How can we combine the old words in new orders, so they survive; so they create beauty; so they tell the truth?" If ever a writer gave voice to the impulse of contemporary choreographers like McGregor, this is it. Wayne McGregor rehearses Raven Girl with artists of The Royal Ballet. Photo by Johan Persson, Courtesy ROH. Nine years after Chroma, Wayne McGregor is embarking upon a new challenge in London: his first evening-length creation for The Royal Ballet. Woolf Works, which has its world premiere in May, will be based on the life and writing of Virginia Woolf, with a brand-new score for orchestra and electronics by Max Richter, the composer of Infra. Don't expect a conventional narrative, however: "I've always been interested in making works that can engage for a full evening without a narrative theme," says McGregor. Woolf Works will weave together elements from the writer's biography and three of her novels: Mrs. Dalloway, Orlando and The Waves. This week, The Royal Ballet will premiere Wayne McGregor’s Woolf Works, a full-length ballet inspired by the work of modernist writer Virginia Woolf. Paired with a new score by Max Richter, Woolf Works is McGregor’s first full-length piece for the Royal, and it is ambitious.